Modern deep-sea science is built on broad international collaborations. We share resources, expertise, and ship time. These exchanges allow scientists from around the world to benefit from a global research fleet that includes dedicated oceanographic platforms like the RRS James Cook or the R/V Atlantis as well as novel vessels-of-opportunity that could include Norwegian container ships, North Carolina ferries, or Papua New Guinea tug boats. There are small differences between the operation of vessels from different nations - new acronyms, different power supplies, and an enduring disagreement regarding what constitutes a proper biscuit (ask a North Carolinian to take you to Bojangles sometime) - but the rhythm of a ship at sea is dictated, above all else, by the ocean. The international and interconnected network of deep-sea scientists is how I now find myself, as an American, sailing aboard a British ship, in a role that could best be described as a Benthic Mercenary. Just as the international marine scientific community is connected by a shared passion for ocean exploration, deep-sea communities are connected by evolutionary heritage, ecologic dependence, and dispersal potential. Connectivity is the personal mission of this benthic mercenary. My role aboard the James Cook is to help identify distinct populations at the Von Damm and Beebe vent fields and investigate how these populations are connected to each other. Are the shrimp at Beebe from the same population as those at Von Damm? Do different snail aggregations at Von Damm represent different cohorts? To what extent do these populations vary from generation to generation? To answer these questions, I use a suite of genetic tools to investigate the underlying processes that shape population structure. By determining how frequently certain mutations appear in groups of organisms and comparing how those mutations spread within different groups, I can determine what constitutes a distinct population, how those populations are connected, how often migration happens between populations, and in what direction that migration occurs. I can also estimate the effective size (a measurement of the smallest a population could be to support the level of observed genetic diversity) of each population. One form of connectivity - the collaboration of deep-sea scientists throughout the world - provides the opportunity to explore another form of connectivity - the population structure of deep-sea hydrothermal vent species at the Mid-Cayman Spreading Center. Yet another form of connectivity - the willingness of cruise participants to share this adventure with the world—allows you to follow along with us at this blog and on twitter, using the #DeepestVents hashtag (https://twitter.com/search?q=%23deepestvents&src=hash). Go to the Tweeps and Media pages to find out the latest news from the scientists on board, plus video clips. us a question about our expedition. At 5000 metres the hydrothermal vents in the Cayman Trough are the deepest and hottest discovered. 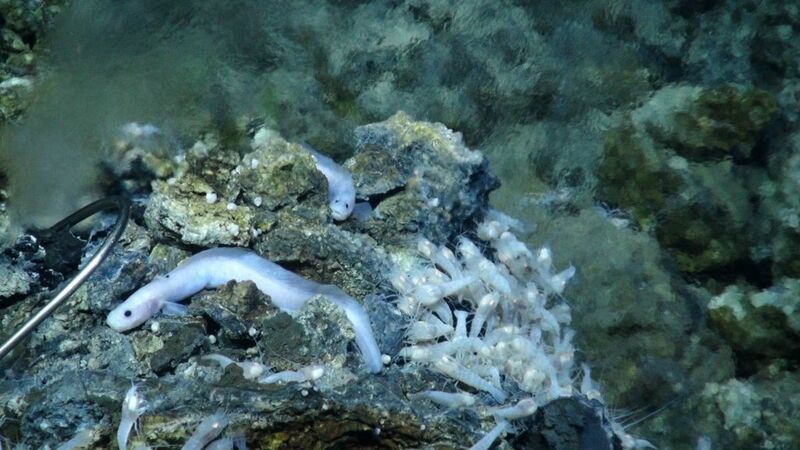 In April of 2010, scientists from the UK’s National Oceanography Centre and the University of Southampton were the first to gaze upon these mysterious vents and the animals that live among them. Find out more about that expedition. Three years later, they are returning with high definition cameras to explore this most extreme of deep sea environments. For every 1000 metres of depth, the temperature of vent fluid rises by 100° Centigrade. It is estimated that the Cayman vents will exceed 400° – making these the hottest vents found so far. Join the scientists on the RRS James Cook day-by-day as they experience the excitement and wonder of exploration in a location like no other.